Monthly meetings will usually be held at 10.00 am on the third Thursday of the month. Our meetings will be at Hyndland Community Hall, 24 Novar Drive. Tea and coffee will be available from 10.00 am and our talk will begin at 10.30 am, finishing at 11.15 am and then announcements etc from 11.15 am to 11.30 am. Prospective speakers or anyone with ideas for prospective speakers can contact our Speaker Programme Coordinator. 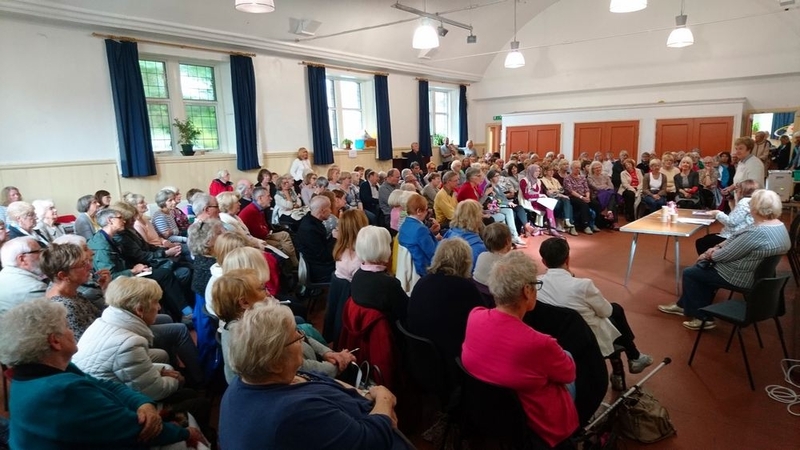 Thu May 16th Meeting Anita Manning - "A glimpse of my world of Antiques and Auctions"
Thu Jun 6th Meeting Westend Walkabout Quiz: Enjoy exploring parts of Hyndland and Dowanhill with a quiz and answer sheet. A fun Summer’s morning! As you follow the clues walking round the route you may well see things and find yourself in places that you did not know about. At a leisurely pace it should take less than 90 minutes. Lunch and Answers at 12.30 pm. The cost of £5 will cover a sandwich lunch and the hire of the Hyndland Community Hall. Groups of 3 to 5 will depart at 10 minute intervals from the Hyndland Community Hall, 24 Novar Drive. You can sign up individually or as a team. If you would like to take part, add your name and pay at the U3A meeting on the 18th April. Or you can contact Catherine our Walkabout Quiz coordinate via our Groups page. Thu Sep 19th Meeting Callum Christie: "Goodbye Colonialism - Farewell Feudalism"
Thu Oct 17th Meeting Gillian Mawdsley: "An insight into Glasgow during WW1"
Thu Nov 21st Meeting Georgia Ramplin: "Regional Community Fundraiser - The work of Shelter Scotland specifically in Glasgow"
Thu Jan 16th Meeting Morag Smith (National Development Worker): "An insight and the history of Glasgow Women's Library"
Thu May 16th Anita Manning - "A glimpse of my world of Antiques and Auctions"
Thu Jun 6th Westend Walkabout Quiz: Enjoy exploring parts of Hyndland and Dowanhill with a quiz and answer sheet. A fun Summer’s morning! As you follow the clues walking round the route you may well see things and find yourself in places that you did not know about. At a leisurely pace it should take less than 90 minutes. Thu Sep 19th Callum Christie: "Goodbye Colonialism - Farewell Feudalism"
Thu Oct 17th Gillian Mawdsley: "An insight into Glasgow during WW1"
Thu Nov 21st Georgia Ramplin: "Regional Community Fundraiser - The work of Shelter Scotland specifically in Glasgow"
Thu Jan 16th 2020 Morag Smith (National Development Worker): "An insight and the history of Glasgow Women's Library"